Male, on Male Atoll, is the capital and largest community of the Maldives, situated in the Indian Ocean near the equator. 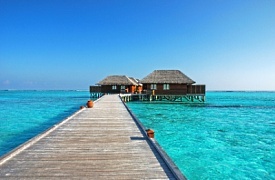 Male is just one of the 1,190 islands that comprise the Maldives. Thanks to the intimate size of the island, it can be explored on foot to see the many faces of this unique land. The Grand Mosque, centerpiece of the Islamic center, is a masterpiece of intricate woodcarving and Arabic calligraphy, with enormous chandeliers providing illumination. The former palace of the Sultan is located in Male's expansive park, and a stroll through the grounds reveals not only the indigenous flora of the Maldives but also the National Museum, which offers an interesting exhibit of royal possessions, artifacts and archaeological findings.